This book is hard to read in its original format, not made any easier by the poor copy of the facsimile edition. It is however a fascinating read as it chronicles Clarkson's journey through the seven churches to his final home in the third commission. The second half of the book is a theological work that I must admit I had trouble following. 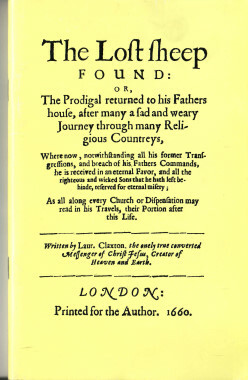 What is interesting is that Lodowick Muggleton is not mentioned once in the book, John Reeve is mentioned a few times but not as much as you would have expected for the prophet of God, the whole tenor of the final half of the book is establishing Clarkson as "the only true converted messenger of Jesus Christ". The messenger did not what to share his self appointed role with the mouthpiece God appointed to the prophet. I find Clarkson's love for his wife to be quite effecting, even in his antinomian days as a ranter (the Captain of the Rant no less) when he lay with many women he still says that "Now in the height of this rantering, I was made still careful for moneys for my wife". Clakson was a really interesting character, if anyone's story could make a film then it is Clarkson. Despite his travels through almost every sect (with the exception of the Quakers) it is interesting that even when his challenge to Muggleton was crushed, his financial support was cut off and he was banned from writing he did not leave the sect and remained a Muggletonian to his death, even abasing himself to Muggleton. It appears that despite his track record he was in his own mind truly a "lost sheep found".